Mostly sunny and windy. High 82F. Winds S at 20 to 30 mph. Higher wind gusts possible..
Clear skies. Low 63F. Winds S at 15 to 25 mph. 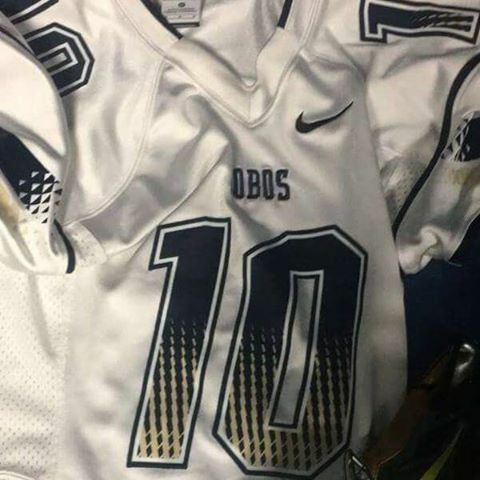 Theo Nash’s varsity practice jersey, number 10. Little Elm residents and schools are mourning the loss of fellow Lobo Theoldrige ‘Theo’ Nash, who drowned on the evening of Aug. 12. Nash, 17, did not resurface after attempting to swim from Little Elm beach to a boat ramp across the cove with four friends in Lewisville Lake, said Little Elm Police Chief Rodney Harrison. According to witnesses, Nash became distressed before reaching the ramp. Harrison said a nearby officer attempted to rescue Nash but could not locate him underwater. Little Elm Fire Rescue, the Lewisville Fire Department Dive Team and Texas Parks and Wildlife game wardens discovered Nash’s body underwater two hours later at 9 p.m. Although the authorities are awaiting the autopsy, Harrison said there did not seem to be any catalysts to the incident. Social media has since overflowed with sympathy and support from the Little Elm community. Nash was entering his senior year at Little Elm High School and was on the varsity football team. Brown said the team will honor Nash in several ways during the season, including donning decals of his jersey number on the back of the player’s helmets. Brown also said the team will keep Nash’s shoulder pads, helmet and jersey set up in his locker during the entire season, and one senior per week will get the opportunity to wear Nash’s No. 10 jersey during a game. Nash’s family, along with the football team, held a candle light vigil at the football field Wednesday night, and the memorial for Nash was held at Cross Ridge Church on Thursday. The 17-year-old’s funeral is set for 11 a.m. Saturday at Shiloh Missionary Baptist Church in Plano. Brown said the team will honor Nash in other ways during the season, and that the fight Nash showed during the summer will be mirrored on the gridiron. Fellow students of Nash expressed their shock on social media. Nash’s neighbor, Wesley Tubbs, made a comment on Facebook the day after Nash’s death. “I will miss Theo every day. I will miss teaching him how to work on his car. I will miss teaching him how to raise his puppy and I'll miss our football talks. R.I.P buddy,” Tubbs stated. Little Elm High School provided special counseling support services on Sunday and Monday in the high school’s library. Going forward, the district will continue to offer counseling services for any student who needs it. Funeral services will be held 11 a.m. Saturday at Shiloh Missionary Baptist Church in Plano, 920 14th St. Donate to the Theo Nash Memorial Fund at the Capital One Bank Little Elm branch, account #3333150912.